When you are trailing in a Conference Final, even after just one game, you want to hit back as quickly as you can. In the second match of Eastern Conference Final, it took Miami Heat a little bit longer to get going than they would have liked to but in the end, they got there, tying the series at 1-1. 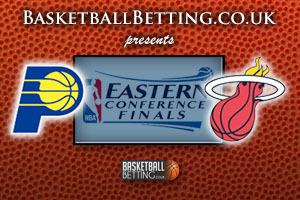 The final score was Miami Heat 87, Indiana Pacers 83. The scoring by quarter ran as 20-21, 21-16, 21-26, 25-20. The Pacers may have led going into the final quarter but this is the stage where big basketball players earn their money and the class of players like Dwyane Wade and LeBron James made the difference on the night. More than 18,000 people were packed into the Bankers Life Fieldhouse in Indianapolis and it was a thrilling game for all the fans. James picked up 22 points throughout the game but 12 of them came in the fourth quarter. This level of focus was also present in the scoring of Wade, who was the Heat’s top scorer with 23, with 10 of them coming in the final quarter. The most notable score from Wade was a reverse dunk, fed to him by James, and this gave the Heat a lead of 86-78 with 21.6 seconds left on the clock. It was a sad end to the evening for Lance Stephenson of the Pacers who grabbed 25 points, 7 assists and a total of 6 rebounds over the course of the game. Crucially though, only 2 of these points were collected in the fourth quarter. While all of the points scored in the game are crucial in determining the final outcome, the statistics of the match show how important it is for the top players to show their true class as the game winds to a conclusion. If Stephenson was able to turn it up a notch in the final quarter or James or Wade didn’t show up in the final quarter, the Pacers may have grabbed a 2-0 lead but as it was, we are back level with a lot of basketball to be played in the Eastern Conference Final. One of the big talking points in the game came in the fourth quarter when LeBron James bore down on the basket. James was on fire in the final quarter but on this occasion, he was stopped by David West and in real time, it looked like a flagrant foul. However, when the referees reviewed the video footage, the made the call that it was just a common foul and this looks to have been the correct call. These sorts of decisions can often decide the outcome of tight matches but with James scoring for fun in the final quarter, Miami managed to seal the victory that tied the series after two games. The two teams meet again on Saturday evening (Saturday May 24th 8:30pm ET) in the American Airlines Arena in Miami. The odds for the game are already available on bwin with Miami Heat available on the money line at 1.33 while the Pacers are available at 3.40.